Kartik sees someone fall in the water and thinks it is Naira and jumps in the water to save her but sees it is some guy and saves him and brings him ashore. 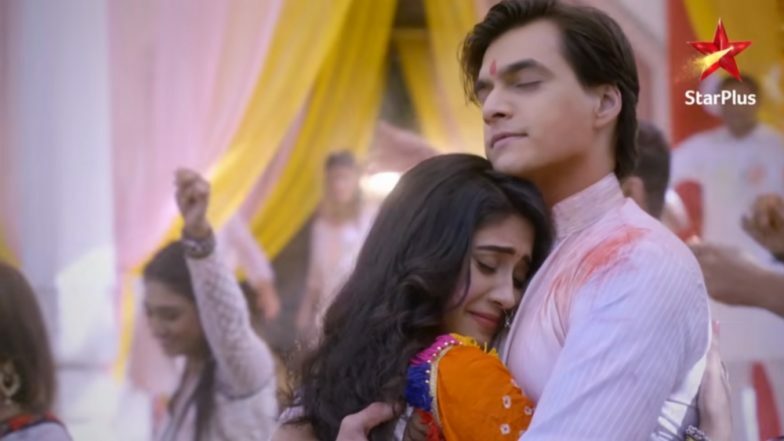 Kartik goes in search and sees Naira unconscious and in the middle of the river and holds her and brings her out and ask forgiveness from her (ohh more saihya naina na rootey mane track is played in the background) Naira says that she had forgiven him earlier only, Kartik is tensed and wonders if she remembered everything from the past. Naira says that he was not at fault as he did this for Krish and for everyone’s good. Naira says she had come to talk to her but due to the accident she forget everything and he had to suffer for all these days. Yeh Rishta Kya Kehlata Hai Spoilers: Naira and Kartik Patch Up After Having Bhaang; Naksh and Kirti Apologise To Everyone! Kartik is happy that Naira remembered everything and has become normal (Rahetey tere bahu mein hai track is played in the background). Meanwhile, all the family is tensed as where are Naira and Kartik, Suhasini says nothing should come between them, just then one girl comes putting the veil and tells that she is Kartik’s wife and that he has married her in her hometown. All are tensed as who is this. In the precap, Naira and Kartik are dancing in a romantic number and enjoying each others company.